I'm not sure what to even say about the shocking - yet not really surprising - revelations broken by Yahoo! and ESPN over the weekend regarding how corrupt college basketball truly is regarding payments to recruits and/or their families. Why does it feel like whichever school wins the national title will eventually have to vacate it like Louisville did for its 2013 championship? I don't see how Arizona can keep Sean Miller as head coach after it was reported FBI wiretaps had intercepted phone conversations between Miller and a runner for an agent during which they discussed paying $100,000 to ensure that Deandre Ayton, Arizona's star freshman center, would sign with the Wildcats. Miller stepped away from the team for Saturday's game but Ayton played. Naturally, both denied the allegations. Arizona has no shot at winning it all if Ayton, perhaps the No. 1 overall pick in the 2018 draft, is declared ineligible (second-leading scorer Allonzo Trier was recently declared ineligible because traces of a banned substance were found in his blood stream; UA is appealing that). Whether Miller is back on the bench for Thursday's game vs. Stanford is up in the air as of now. I highly doubt he ever coaches for Arizona again. ACC game at 9 p.m. ET on ESPN. Miami was trending toward the NCAA Tournament bubble but has probably played itself off that by following a three-game losing streak with back-to-back wins. The Canes escaped at home against a bad Boston College team on Saturday, 79-78. Freshman Lonnie Walker IV hit the winning 3-pointer with 2.3 seconds left as UM rallied from 14 down. Walker's probably a one-and-done guy who could be a 2018 lottery pick. North Carolina is playing for a top-four finish in the ACC and the double-bye that accompanies that. UNC was one of the schools mentioned in that Yahoo! report but not involving a current player. The Heels have been off since last Wednesday's 78-74 win at Syracuse, their sixth straight victory. Might North Carolina be caught looking past this game and to Saturday's regular-season finale at Duke? It's the only scheduled meeting between these schools. Last year, they split. The Canes beat the visiting and No. 9 Tar Heels, 77-62, in the regular season behind 30 points (on just 11 shots) from Bruce Brown - the sophomore remains currently sidelined after surgery a few weeks ago for a broken foot. Brown's point total was the highest by a Hurricanes freshman since they joined the ACC, and Miami improved to 5-4 against North Carolina under Jim Larranaga. 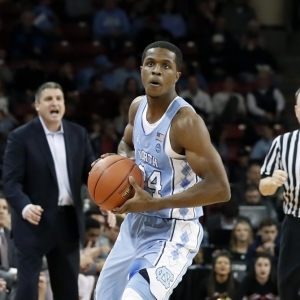 However, the Heels got payback with a 78-53 blowout in the ACC Tournament. Key trends: The Hurricanes are 1-7 against the spread in their past eight after a win. The Heels are 5-1 ATS in their past six. The home team is 5-2 ATS in the past seven meetings. Big 12 matchup at 9 p.m. ET on ESPNU. K-State is on the NCAA bubble, probably the right side of it, at 20-9 overall and 9-7 in the Big 12. The Wildcats had a three-game winning streak snapped on Saturday, 86-77 at Oklahoma. Kansas State was just 4-for-21 from 3-point range. Barry Brown led KSU with 28 points. It was his 11th game this season scoring at least 20, and he leads the team in averaging 16.6 points per game. TCU won its third straight game Saturday, 82-72 over Baylor to get to .500 in the Big 12. Alex Robinson scored 15 of his 22 points in the second half and the Frogs shot 70 percent from the field after intermission. TCU swept Baylor in a season series for the first time since 1989 back when they were in the Southwest Conference. K-State beat TCU in Manhattan when the Frogs were ranked No. 24, 73-68, on Jan. 20. I recommend you go back and watch highlights of that one because KSU was wearing terrific throwback lavender and deep purple jerseys from the team that reached the 1981 Elite Eight. Dean Wade led the Wildcats with 20 points. Frogs coach Jamie Dixon was ejected in the second half after a second technical. Key trends: The Cats are 4-1 ATS in their past five after a loss. The Frogs have covered five of their past six at home. K-State is 4-1 ATS in the past five in the series. We stay in the Big 12 at 9 p.m. but on ESPN2. Oklahoma boosted its NCAA Tournament chances - you know the TV networks want to have freshman sensation Trae Young in the Big Dance - with an 86-77 home win over Kansas State on Saturday to end a six-game losing streak. Young had 28 points and seven assists and continues to lead the nation in scoring (28.3 ppg) and assists (9.1 apg). He was 6-for-10 from 3-point range against KSU and had five turnovers compared to a conference-record 12 in the first meeting with the Wildcats. At 17-12 and 7-9 in the Big 12, Baylor is definitely a bubble team. A two-game losing streak hasn't helped matters. The Bears were beaten by 10 at TCU on Saturday. Leading scorer Manu Lecomte was just 1-for-10 from the floor in that one with five points. Baylor can't afford a loss here because it probably falls to close the regular season at Kansas State on Saturday. On Jan. 30, Baylor lost 98-96 at No. 12 Oklahoma, the Bears' season-high fourth straight defeat at the time to drop them to 2-7 in the conference - they looked nothing like a potential NCAA Tournament team then. Young had 44 points, 31 in the second half. Lecomte scored 29 points and Nuni Omot scored 23 for Baylor. King McClure missed a wild shot at the buzzer. Key trends: The Sooners have failed to cover their past eight on the road. The Bears are 6-2 ATS in their past eight overall. The underdog is 4-1 ATS in the past five meetings.